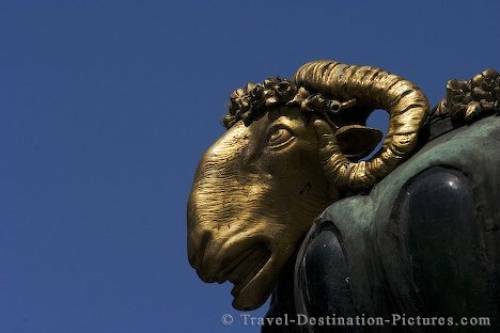 A statue of the head of an aries cast in gold on display in the city of Vienna, Austria, Europe. Strolling through the inner city of Vienna one can discover thousands of interesting places and details. This particular head of an aries was placed in front of a well. Picture of the Golden Aries at a well in downtown Vienna, Austria, Europe.